The Suit And Tie star, in a black shirt and trousers with a trilby hat, kicked off his set with Like I Love You armed with a guitar before taking the crowds on a 90-minute funk-filled journey. The 32-year-old singer and actor, backed by his band The Tennessee Kids, topped the bill at London's Olympic Park on the festival's first night, which included earlier sets from Snoop Dogg, now known as Snoop Lion, John Legend, Frank Ocean and Miguel. 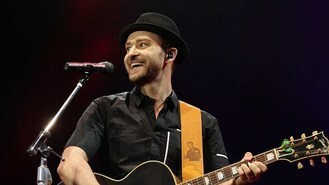 Timberlake, who also showed off his various talents by playing the piano, beatboxing and dance moves, got festival-goers up on their feet with crowd-pleasers Senorita, Rock Your Body, Cry Me A River and Summer Love, before performing tracks from his latest album The 20/20 Experience, including Mirrors. "London, you alright? I know you've been here all day but we are starting the party right now," he said. "I am slightly p*****. I can't believe you are all here right now. We are here now. I promise it won't be so long again." Timberlake was joined by rap superstar Jay-Z - who is the headlining act on the main stage on Saturday - on Suit And Tie before closing with SexyBack. The duo will then close the festival together, performing as Legends Of The Summer, on Sunday. This is the latest major UK gig for the US singer - who is married to actress Jessica Biel - following his performance at the Capital FM Summertime Ball. He previously played an intimate gig at the Roundhouse in north London in February, after performing at the Brit Awards 2013 - his first shows in six years after a hiatus from music.